COULD YOU WRITE a poem about bacon? Julie Hathaway of Rochester did. She penned “Bacon,” one of 30 poems selected for publication in 2012 Poetic Strokes: A Regional Anthology of Poetry from Southeastern Minnesota. When I saw the poem title, I had my reservations. How could bacon possibly be poetic? Julie proves that bacon, bacon grease specifically, can certainly be poetic when connected to your past—to fried eggs and fried potatoes and a cast iron skillet—and to your life today. This unlikeliest of topics made for a nostalgic read in a volume that highlights some strong regional writing. You’ll find poems like “Zumbro River Almanac” by Kevin Strauss of Rochester, where the Zumbro slices through the heart of the city. Other poems in the volume, such as “To the North” by Betty J. Benner of Austin, “Sunrise” by Nicole Borg of Wabasha and “Jacobs Lake” by John Chernega of Winona, also possess a strong sense of place. And then there are poems like “Scottie’s Apple Pie” by Bev Jackson Cotter of Albert Lea. It’s perhaps the sweetest verse in this volume as Bev writes about the precious memories a mother tucks into her heart after baking a pie from the crab apples her four-year-old picks. On the opposite end of youth, Peter C. Allen of Kenyon writes about his aged, dying father in a poignant poem. Then, to lighten the mood, Riki Kölbl Nelson of Northfield compares a first snowfall to rollicking, out-of-control children slitting bed covers and spilling feathers from a sky castle. It is a playful image. All in all, this sixth edition of Poetic Strokes, a project of Southeastern Libraries Cooperating and financed with Minnesota’s Arts and Cultural Heritage fund monies, is a delight to read. 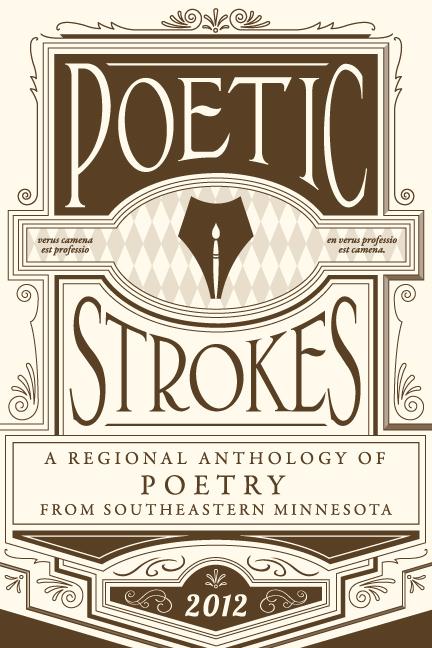 You will find copies of 2012 Poetic Strokes now available for check-out from libraries within the 11-county SELCO system. FYI: My poem, “Writing Poetry as the Sun Rises,” is published in this 2012 anthology as one of 30 poems selected from 202 submissions.